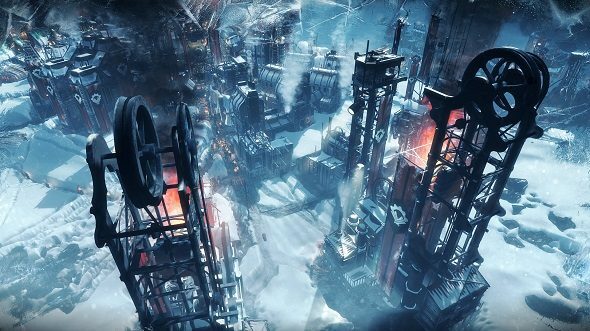 The snowbound micro-city of Frostpunk is going to be expanding this year, with free additional content in the form of new game modes and customization options. Developer 11 Bit Studios revealed their roadmap for 2018, saying they’re planning on continuing to support Frostpunk into next year. One of Frostpunk’s interesting spins on the city management genre is the hard time cap. You have 45 days, and your settlement either survives, or it doesn’t. Upcoming content will assume the former, giving players ways to continue playing once they’ve shepherded their city through the base campaign. The roadmap doesn’t provide much in the way of detail, but there are a few key tidbits to note. Coming in June, there’s Survivor, a new game mode. At some point after that, basic customization for people and automatons will be added – that could mean specializations or equipment for citizens, and potentially add-on modules for Frostpunk’s towering robots. If Frostpunk is a bit too chilly for your taste, try something from our list of the best building games on PC. Later on, we’ll see The Builders, which is a new scenario, followed by another new game mode called Endurance. Finally, there’s a planned update called “Winter Snapshots,” and how that will work is anybody’s guess. All the new content will be free to everyone who owns the game. Frostpunk had a remarkably strong launch, selling more than 250,000 copies in its first three days on Steam, and 11 Bit CEO Grzegorz Miechowski said at the time that the success confirmed their plans to create follow-on content for the game. In his Frostpunk review, Julian said he was struck by how what seems like a fairly simple colony building game is able to quietly turn you into a dictatorial monster. “Frostpunk isn’t about managing a city as much as it is a game about managing your own moral decline,” he wrote.